The purpose of this study was to investigate the relationship between chronotype, sleep problems and long-term (maladaptive retirement from shift work) and short-term (perceived tolerance of shift work) tolerance of shift work in community-dwelling people who worked as a shift worker for over a year, in a retrospective manner. Ninety-seven shift workers participated in the study. They were divided into three groups: current shift workers (CS: n = 42), workers who retired from shift work for reasons other than maladaptation to shift work (past shift workers with adaptation: PSa, n = 42), and workers who retired from shift work due to maladaptation to shift work (past shift workers with maladaptation: PSm, n = 13). 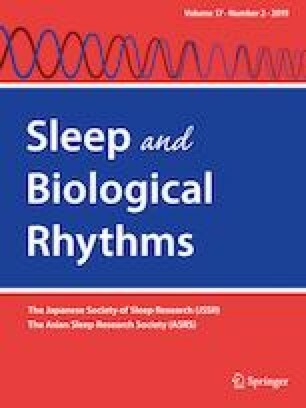 Perceived adaptation to shift work, shift work-related sleep problems, and chronotypes were evaluated by a questionnaire. Among the current shift workers, perceived adaptation to shift work is correlated with chronotype and early morning awakening. Among past shift workers, PSm showed lower perceived adaptation to shift work than PSa, but no difference was found in the chronotype. Furthermore, in the logistic regression analysis, early morning awakening was found to be the significant predictor for the incidence of maladaptive retirement from shift work, but the chronotype was not. The findings of this study suggest that the perceived tolerance to shift work in evening chronotype does not necessarily coincide with maladaptive retirement from shift work. From a long-term perspective, consideration of managing sleep problems might be more effective rather than individual tolerance to nighttime sleepiness for the work placement in shift workers. This study was supported by an Intramural Research Grant (23-3) for Neurological and Psychiatric Disorders from NCNP. The authors report no conflicts of interest. The authors alone are responsible for the content and writing of the paper. This study was supported by an Intramural Research Grant (23-3) for Neurological and Psychiatric Disorders from NCNP. All participants were first presented the opt-out model of informed consent.